Well, it happens. Games sometimes get delayed. Operation Abyss has been pushed back to June 9th in the US in both digital and physical editions. 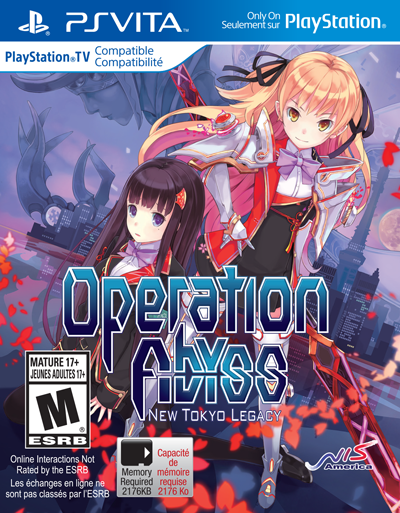 Santa Ana, Calif. (February 17, 2015)–NIS America is announcing that the dungeon crawler RPG, Operation Abyss: New Tokyo Legacy, is arriving exclusively for PlayStation®Vita with a new release date of June 9, 2015 for North America and June 5, 2015 for Europe! The title will be available as both a physical and digital release. Fight through the Abyss and battle against the Variants—but only if you dare! Recruit and train a unique group of six Xth members to venture into the Abyss. Customize each member from one of ten distinct Blood Codes. Each Xth member's appearance, class, personality, morality, and stats may be molded to the player's preference. The labyrinthine dungeons of New Tokyo offer 40+ hours of dungeon crawling action with traps, secret doors, challenging enemies, and gorgeous art throughout. Dive into the unique dungeon crawler setting of Operation Abyss and lose yourself in the gorgeous world, featuring real-life locations rendered by Tetsu Kurosawa and Oxijiyen. A gripping story blends heavy sci-fi elements with a setting to give the game a unique feel.